Bunch of dudes in leather and sunglasses, talking about weird stuff and pushing drugs on you… SOUNDS LIKE A PARTY! I had a really nice april fools joke for all you peeps but since it landed on a sunday it wouldn’t have worked. I’ll save it for next year. so instead have some BONUS MATERIAL! also Brian King of Inkoutbreak and MayoKing fame drew up some warnings for me about marriage. So I got into the Mists of Pandaria beta… yeah… …. Cuz white guys can’t fly. I want a hand with two thumbs… that would be SO handy sometimes. That really wasn’t supposed to be all punny. Oh well. 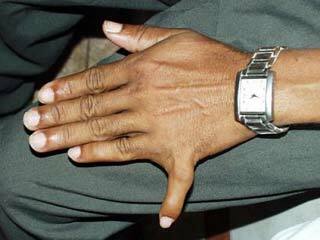 A third hand, with two thumbs…. wait, what? That’s a skull grabbing hand right there. Or an energy sword, whatever floats your boat. Anyway, I think that trying to figure out the colors of the pills in monochrome would have had some novelty, but Futurama has done that joke recently. Though I must say, I do enjoy the comics you color. Tis a nice change of pace. I also enjoy the Matrix, and humoring the thought of Will Smith as Neo; which could have actually happened, had he not turned down the role in order to be in Wild Wild West. I also like rambling a bit, obviously. Two thumbed, third arm, handing me strange drugs? and in color?! How could I resist? The tie looks nice as well. I wanna take a million green pills! Then I’ll slip them in the water supply. Then, MORE RAINBOWS!! i’m glad i’m not the only one that flipped out about color. Is that a subtle reference to the ME3 ending? If you haven’t gotten to it yet….. surprise? 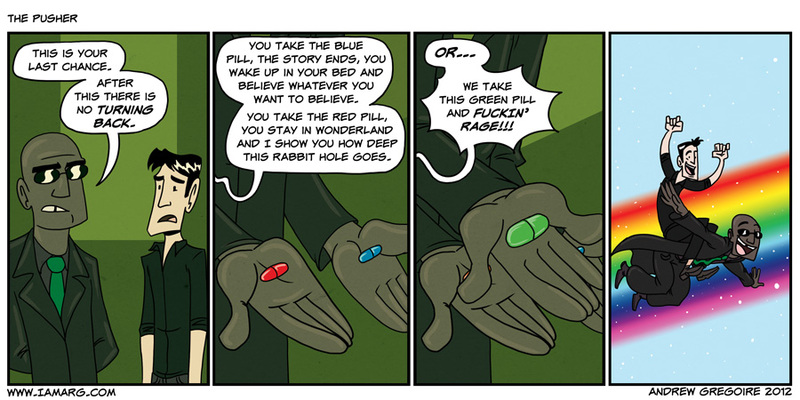 So the green pill turns you NYAN?? ?